Miniature in Glass bottle 5 cl. 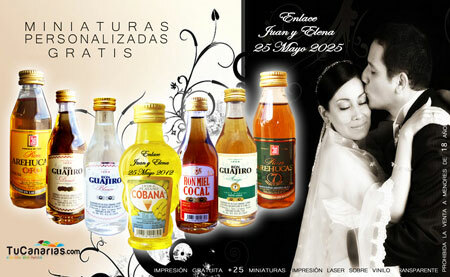 of GUAJIRO GOLD RUM, with FREE CUSTOMIZATION. Service available for orders of 25 or more models of the same or different models. Elaboration: We present this young rum, made with cane spirits, most of them young and with olds of giving personality to this rum canary gold, with bright golden old man in the range of ochres. Clean and honest, with high intensity, notes cane, citrus, silky, wide touch, traverse half, with notes of vanilla, mellow and persistent; leaving good memories. Ideal for taking it alone or in combination.